India Government is much concern about poor or lower income working people for having retirement at old age . This government pension scheme is for both organised or on organised sector worker one can not afford huge provision for their old age. This scene has been started in 2015-16 with the Name of our previous Prime Minister Sri Atal Bihari Bajpeyi, very much focused on Unorganised worker. Atal Pension Yojna is regulated by Pension Fund Regulatory and Development Authority (PFRDA) ,where as National Pension Scheme is the main architecture. GOI wil also participate 50% of the contribution or Minimum Rs 1000 which ever is lower. GOI will co-contribute to each eligible subscriber, for a period of 5 years who joins the scheme between the period 1st June, 2015 to 31st December, 2015. The benefit of five years of government Co-contribution under APY would not exceed 5 years for all subscribers including migrated Swavalamban beneficiaries. Who are not eligible to receive Government Contribution under Atal Pension Yojna? Beneficiaries who are covered under statutory social security schemes are not eligible to receive Government co-contribution. Lets see the above chart to understand, If you age is 40 and you want pension of Rs 5000 monthly at the age of 60 then you have to contribute Rs 1454 monthly. Bank will charge you if you fail to make payment on time ,it will be minimum Rs 1 and maximum Rs 10. After 6 month ,your account will be frozen. After 12 month ,your account will be deactivated. After 24 month ,your account will be closed. So you must opt auto debit facilities from banker deduction of such contributions. When Pension will Start n Atal Pension Yojna? 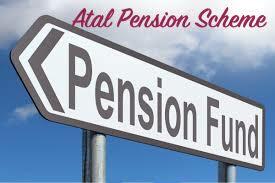 If you want to exit from Atal Pension Yojna then it is permitted at the age with 100% annuitisation of pension wealth. On exit, pension would be available to the subscriber. Nominee will get this pension. LIC is selling Govt Pension Scheme for Senior citizen that is Pradham Mantri Vayo Vridh Yojna.